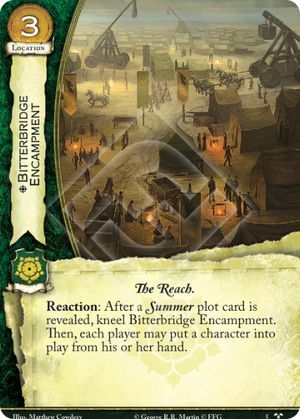 Reaction: After a Summer plot card is revealed, kneel Bitterbridge Encampment. Then, each player may put a character into play from his or her hand. Across the Seven Kingdoms #5. This ability is triggered after all "When revealed" abilities of all plots have resolved. If the ability is cancelled with Treachery, Bitterbridge Encampment does not kneel (kneeling is part of the effect here, not a cost), and can be used again if more than one Summer plot was revealed. When resolving the ability, the first player chooses and reveals a character, then the second player does the same (with full knowledge of his opponent's choice), and so on, and then all characters enter play simultaneously. You do not need to reveal the target character from hand before your opponent decides whether or not to cancel (unlike Arianne).